I know I’m like the lone woman on the planet who just can’t do the whole super sweet, basically dessert, marshmallow-topped sweet potato thing at Thanksgiving. I’ve tried different recipes (many of you have sent me versions over the years after I lament my distaste) but I’ve never been fully converted. That’s ok, though. So many of you love them that I think the marshmallow industry is perfectly safe. I’m here to represent those that might want to change up the ol’ sweet potato casserole. A couple months ago when I was inhaling stuffed sweet potatoes for dinner, I had the thought that all of the flavors were screaming to be made into a sweet potato casserole for Thanksgiving this year. And so I went for it. Living life on the edge and all that. And wow, this dish is so incredibly yummy (and easy). If you just can’t take the plunge for Thanksgiving. Don’t worry. Me and my sweet potato casserole aren’t going anywhere. We’ll be here any other night of the week for ever and ever because just like any fabulous recipe, this shouldn’t be made only once a year. Three Years Ago: Thanksgiving Dinner At-A-Glance! Next Post » Mel’s Mini Holiday Gift Guide: Games, Games, Games! I made this today for our thanksgiving and I was so skeptical because I’ve never made anything like this. But It was amazing! I’m so glad I have plenty leftover to enjoy the next few days. And I definitely don’t think this is an exclusive dish for thanksgiving. It will make a great side to so many dinners in the future. Thanks Mel! Some of my guests don’t eat pork; how do you think turkey bacon would work with this? Are the apples about 1/2″ chunks? Can’t quite tell from the pictures. Sorry for the late response, but they are slightly smaller than that, probably (although it doesn’t really matter to the finished flavor – it really is just a matter of preference). Can you use an onion or shallot instead of a leek? One more question: If I want to make this the day before, should I assemble it and refrigerate, waiting to bake it until right before dinner, or bake it the day before and just reheat it the day of? I would assemble and then bake the day of. Would it be ok to substitute dried herbs in this recipe? If so, how much would you use? I think so – maybe 1/4 to 1/2 teaspoon dried rosemary and 1/2 to 1 teaspoon of dried (not ground!) sage? Mel – obviously you’re my domestic goddess that helped me become one in my household too. There is no week without at least half of the dinners from your blog. 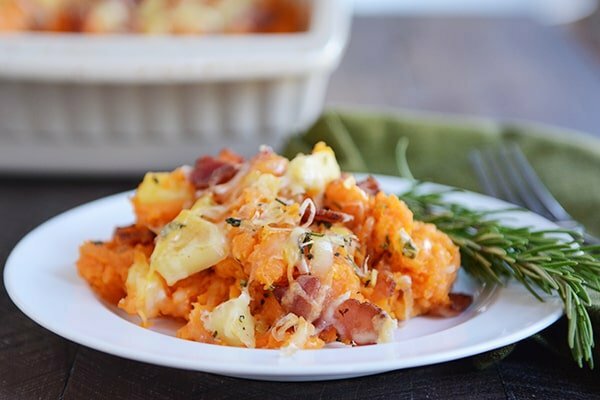 I intend to make this recipe tonight and was wondering – wouldn’t it be easier aka faster to cut the sweet potatoes in half before putting them in the oven? Would that change something for the recipe? Hey Diana – you could try that, but sweet potatoes can drip a sugary liquid while they bake and cutting them in half might make that worse, so that would be my only hesitation. I always thought I hated sweet potatoes, but turns out I just hated sweet potato casserole. I was in charge of bringing the casserole for Thanksgiving this year, and I was searching for an alternative and found this recipe. So good!!! I ended up cubing and roasting the potatoes for 40 minutes instead of mashing them, and it was a hit, even with the marshmallow lovers! How can I make this without bacon? Would olive oil work? You could definitely try that – or just leave out the bacon. Could I make this a day or two before thanksgiving? Would you go ahead and bake it to completion and then reheat day of? Or just bake the potatoes and then assemble it all and refrigerate and do the final bake day of? Do you think this could be a make ahead recipe? Like could I make it this week and then serve it for Thanksgiving. What would you suggest to, would I just not cook it, or freeze it? If you want to only refrigerate it, I wouldn’t make it more than a day or so in advance. I think you could probably make it this week and freeze it, but I haven’t tried that myself, so I’m not sure how all the ingredients would fare. However, I definitely think it’s worth a try! Thanks! Any advice on reheating? It looks like someone else also asked this. Do you think it would be better to assemble, freeze and then thaw and reheat the day of, instead of fulling baking and then baking again? I know you haven’t tried it, just curious about your advice? Yes, I’d probably freeze before baking vs baking twice. Do you think this would work well made early and frozen? Hey Staci – I haven’t ever frozen it, but I think it might work just fine! 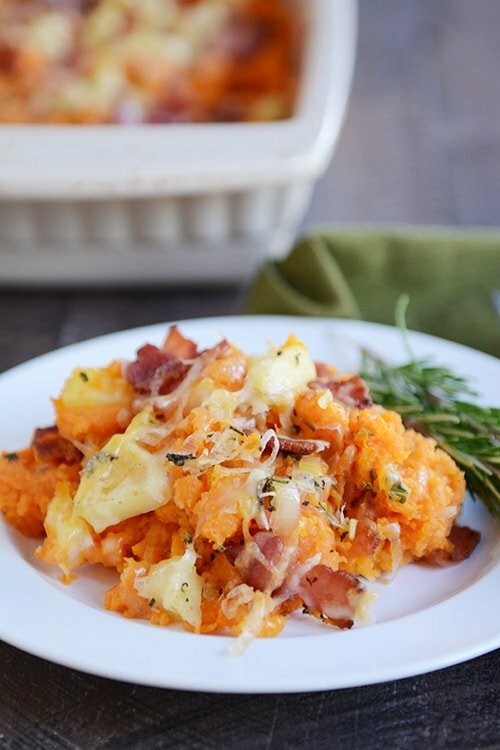 Delicious savory sweet potatoes! The bacon and cheese take it over the top!! I know that it is not a problem with mashed potatoes (regular or sweet), and the only thing that “might be a problem” would be the apple. Thanks, and I just love your recopies! I think this would freeze great, Richard! 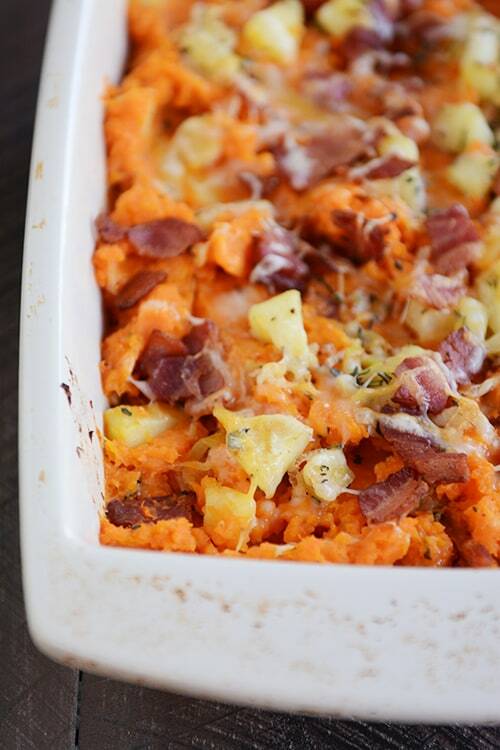 I dread the “sweet potato dessert” side dish every thanksgiving – it ruins such a delicious vegetable!! My mom’s recipe is yams, apples, and parsnips baked in a savory orange sauce and topped with pecans. TO DIE FOR. How did I miss this last year when you posted it? So glad you linked to it in your Russian Potato and Mushroom Leek Soup recipe. We love all things sweet potato at our house (but NOT with marshmallows, not ever!). I plan to make this as a main dish and serve a salad and roasted asparagus as sides. My mouth is already watering! Thank you Mel – you and your website and your recipes are my absolute favorite! Hi Mel, do you think I could bake the sweet potatoes the day before, if I scoop out the insides and mash it up, would they keep in the fridge overnight? I would like to know what the calorie count is on this recipe. I don’t provide the calorie information for my recipes, but there are a lot of online calorie calculators you can use. Good luck! Hi- You are definitely not the lone woman who does not like the loads of typicsl sweet stuff added to sweet potatoes. Mine is likely due to the fact that I tend to get hypoglycemic quickly and cannot have too much sugar in foods, so the idea of heaping extra sugar onto an already sweet vegetable seems counter productive. 😉 Thanks for the variant in recipe. It is sensational! I was really hesitant to try these as written because of the apple chunks. But all the other wonderful ingredients won me over and I decided to leave the apples in. These turned out great! They were savory ,delicious, and looked so beautiful on the plate. This looks really delicious, but I was wondering if you thought it would work as well if the sweet potatoes were left in chunks and not mashed at all? I kind of like a chunky sweet potato myself. Sure! I think that’s certainly worth a try. I made this tonight and left the potatoes cubed. Turned out great! Mel, you win, AGAIN. 7.5 months pregnant, craving cheesy-bacony something, I hit your site and see this on the front page. And thrown together with savory sweet potatoes? It was fate. I winged it with some ingredients- onions instead of leeks, different kind of apple, no fresh spices, colby jack and mild cheddar- but stuck to the directions, and it was FANTASTIC! I could’ve eaten a giant plate of just casserole for dinner. This was also approved by husband and 2-year-old, so it’ll be made again. I’d double if making for a crowd, because it would go fast! Mel, you win. Again. My pregnant self was craving something cheesy-bacony. So I hit your page and this is right up front. I’m a fan of savory sweet potatoes, too, so this was destiny. I winged it with a few parts- onion instead of leeks, different kind of apple, colby jack instead of monterrey, no fresh spices… and it was AMAZING. I could’ve eaten an entire plateful by myself! This also got approval from husband and 2-year-old, so it WILL be made again. I would double this to make for a big dinner, it would go fast! This looks so yummy! Add me to the list of people that hate the sweet potato/marshmallow concoction that is so traditional for Thanksgiving. I’ve been trying out different savory recipes for the past few years but haven’t found “the one” yet. I think we will have to try this one this year! How do you think this would taste without the cheese? I’m joining a family for Thanksgiving that doesn’t eat dairy. It would obviously have a bit of a different flavor but I think you could get by without it. Agree with the marshmellows… However I do LOVE the sweet potato soufle recipe that has become tradition at our family feast with butter, sugar, eggs, milk, vanilla and a strussel topping that includes coconut, walnuts, Brown sugar and of course more butter…yum! Anyway, I’d like to incorporate this recipe to our traditional lunch time hors d’ouevers (yes I had to look up spelling). Do you think I could make it in mini muffin tins for a finger size serving? I’m with you on savory sweet potato dishes instead of super sweet ones! I like to slice peeled sweet potatoes into about two- bite sized coins, toss with olive oil, then sprinkle on orange peel, paprika, and thyme. I bake them on a greased sheet at 350 for an hour, covered with foil for the first 30 minutes. We don’t do marshmallows but we do like the pecan praline type of topping but a few years back I happened to catch Paula Deen cook with her son and they made a sweet potato gratin with caramelized onions (made with some brown sugar and cayenne pepper but the dish does not come off sweet) which intrigued me. I am a glutton for punishment …now I make both to keep the traditionalists happy and myself because I prefer the savory. This looks so good! I can’t do sweetly dressed sweet potatoes either! Can’t wait to try it. Alright, Mel. How does one go about picking an exemplary leek? Haha, well, if you are me, you look for ones that aren’t wilted or brown and cracking on the green ends. And I like more medium-sized ones (there are some I’ve seen that are enormous – they scare me and I stay away from them). Mel, thank you for all you do to keep our kitchens full of delicious meals! You are on celebrity status at our house, and I personally, will mourn the day you decide you can’t keep your blog going for whatever reason. I’m with you regarding the marshmallow/sweet potato concoction. I’m fortunate though because nobody in my family will eat them either. This looks delicious and we will be trying it! Yum! 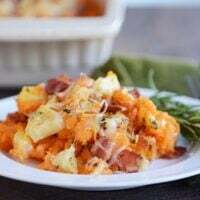 We’ve been doing twice baked sweet potatoes with cheddar cheese, butter, and bacon the last couple years (http://www.tasteofhome.com/recipes/twice-baked-sweet-potatoes-with-bacon), but maybe we’ll try this one this year! Looks delicious! I’m going to trust that the sweetness from the apples and sugar does not take away from the savory goodness of the cheese and bacon (plus, I love baked apples). You’re not alone when it comes to not liking the “whole super sweet, basically dessert, marshmallow-topped sweet potato thing.” I despise it. Don’t feel alone, no marshmallows on my yams…..ever. This looks great. I would be dead if I changed stuff around for Thanksgiving so I’ll just have to make this as a side dish for a normal dinner. This is right up my alley. I love sweet and savory dishes. Mel, how would you suggest making this ahead? Just make it and refrigerate for a day or so? Yep! I think it would do quite well like that. I am totally with you on the marshmallow sweet potato casserole. Yuck! This though looks amazing! Unfortunately, the family won’t go for ANY deviation from the standard Thanksgiving menu. They are total traditionalists. So, I may have to try this next week with a regular dinner.Looks great! This sounds wonderful I’m not a huge fan of the marshmallow casserole although I do love the casserole with the pecan/praline topping. This sounds like a great variation with all of the savories and the apples – yum! The only way I ever had sweet potato was with marshmallows on Thanksgiving. I thought that I hated them. Anything that required that much “help” must be yucky, right? Then, I reluctantly tried them naked. Just mashed with a little butter and salt. I was converted. So I roasted them with olive oil. I was not only converted, I was a missionary! So far I haven’t converted anyone else. But bacon might be the thing that wins their hearts.